I discovered Michael Robotham while visiting New Zealand, and after reading Life or Death, (2015) which he won the UK Gold Dagger for and was also shortlisted for the 2016 Edgar Allan Poe Award for best novel, proceeded to pick up all his previous books. 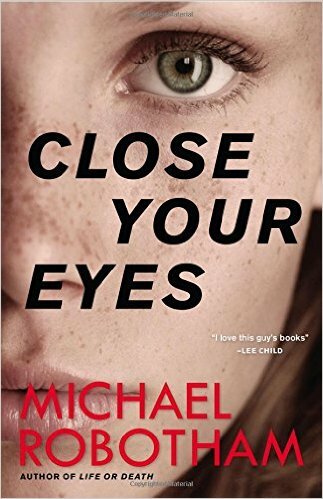 He does not disappoint in any.his latest book, Close Your Eyes is a must read for lovers of suspense/crime thrillers.One of fiction's best sympathetic characters, (Joe O'Loughlin) returns. Joe is a clinical psychologist suffering from Parkinson's disease who is drawn into an investigation into the murders of a mother and her daughter. Other murder victims begin to mount and suspects abound keeping you guessing until the shocking reveal.There are many suspense writers today and Mr. Robotham belongs at the top of the list. He tells great stories, keeping the reader guessing, making us laugh, frightening us and turning the pages.If you have not yet discovered Mr. Robotham, order this book. You can message me the thank you!